The Tsarnaev brothers’ violent rampage last week not only had a terrible human toll, it also revived the tough guys’ “the sky is falling” narrative. And the tough guys always react in the same way: they demand we be very scared, especially about foreign jihadists in our midst. We need to immediately stop immigration reform, suspend Miranda rights, and probably even impose a moratorium on all cookware. Once the boys were identified and the press was drawing the Chechnya connection, I kept thinking that these brothers had finally become uniquely American, though something was missing. Come on, what is more American than a psychologically deranged person – disgruntled for any number of reasons – lashing out at innocent bystanders, resulting in a blood bath? The only thing that kept the Tsarnaevs from earning true citizenship was that they hadn’t gone on a shooting spree (at least not until confronted by the police). And that was the good news for Massachusetts because had they used the Red, White and Blue weapon of choice, we would have seen death tolls in the high double digits, as we saw in Aurora, Sandy Hook, Tucson and Columbine. But Massachusetts wasn’t the only one to benefit from the fact that these boys were not American enough to inflict real carnage. The NRA also must have let out a huge sigh of relief. Everyone was so focused on their makeshift bombs, that no one was asking how they got their hands on a sizable stockpile of guns. Moreover, we were able to focus on Islam as being inherently violent and not on how guns and the violence they cause are are unique to American society. So, for example, when a crazy Muslim American shoots up an American military base – something oh so uniquely American – we immediately call it terrorism and blame Islam. But if that American man had not been Muslim, as in the other 61 mass shootings during the last 30 years (seven this year alone), we’d all be talking about mental illness, how we’d be safer if everyone were armed, and generally treating the senseless murders as an unavoidable natural disaster that lasts a two day news cycle. Consider that we have since learned that the Tsarnaevs did not receive any help from foreign terrorist organizations. They were, like in the case of Columbine, nothing more than very disturbed young men, intent on inflicting harm and getting attention; what Juan Cole has called “a tale of adolescent rebellion“.
. . . Clearly, we are a violent country. Our murder rate is three to five times that of most other industrialized countries. The massacres that regularly take place here are predictable in their occurrence, if not in their time and place. Moreover, and more telling, our response to violence is typically more violence. We display our might — or what is left of it — abroad in order to address perceived injustices or a threat to our interests. We still have not rid ourselves of the death penalty, a fact that fills those in other countries with disbelief. Many of us, in response to the mindless gun violence around us, prescribe more guns as the solution, as the Republicans sought to do during the gun debate. And we torture people. It is as though, in thinking that the world responds only to violence, we reveal ourselves rather than the world. 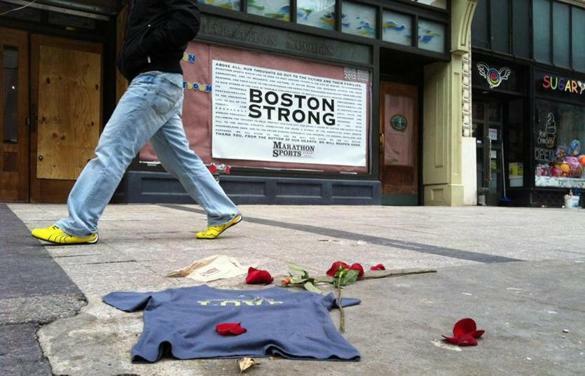 Why is Boston ‘terrorism’ but not Aurora, Sandy Hook, Tucson and Columbine? Over the last two years, the US has witnessed at least three other episodes of mass, indiscriminate violence that killed more people than the Boston bombings did: the Tucson shooting by Jared Loughner in which 19 people (including Rep. Gabrielle Giffords) were shot, six of whom died; the Aurora movie theater shooting by James Holmes in which 70 people were shot, 12 of whom died; and the Sandy Hook elementary school shooting by Adam Lanza in which 26 people (20 of whom were children) were shot and killed. The word “terrorism” was almost never used to describe that indiscriminate slaughter of innocent people, and none of the perpetrators of those attacks was charged with terrorism-related crimes. A decade earlier, two high school seniors in Colorado, Eric Harris and Dylan Klebold, used guns and bombs to murder 12 students and a teacher, and almost nobody called that “terrorism” either. In the Boston case, however, exactly the opposite dynamic prevails. Particularly since the identity of the suspects was revealed, the word “terrorism” is being used by virtually everyone to describe what happened. After initially (and commendably) refraining from using the word, President Obama has since said that “we will investigate any associations that these terrorists may have had” and then said that “on Monday an act of terror wounded dozens and killed three people at the Boston Marathon”. But as Abunimah notes, there is zero evidence that either of the two suspects had any connection to or involvement with any designated terrorist organization. The arsenal found with the surviving Boston Marathon bombing suspect upon his arrest Friday included at least four firearms, one of which was an M-4 carbine rifle, a weapon similar to ones used by American forces in Afghanistan, the Times reported Sunday. Together, the Tsarnaev brothers fired about 80 rounds in a shootout with police officers, yet it appears neither brother was licensed to carry firearms. You can kill 20 children under the age of 10 in the U.S., and guns don’t kill. Meanwhile, you kill 3 people with pressure cookers, and the next thing you know, pressure cookers are being pulled off the shelves at stores, and are being, quite literally, considered Weapons of Mass Destruction. Yet no one is discussing how the brothers got their hands on the guns or learned to use them. We might have to block all jihadist websites that depict how to build a bomb, but closing shooting ranges would be sacrilegious to the American soul. To make matters more interesting in a violence thirsty country, the tough guys call for the President to suspend Miranda Rights. Of course, no one would ever dare suspend the alleged Second Amendment right to bear arms. Once again, that would be blasphemous. Yet, at the most minor threat – two young adults armed with pots and pans — and our rough and tough defenders are eager to demonstrate their toughness against those who attack our freedoms by immediately suspending those freedoms. At Aurora, Sandy Hook, Tucson and at Columbine, when gun owners plowed down innocent victims in much greater numbers with their automatic and semiautomatic weapons, these same advocates of American freedom were – you guessed it – out there defending our Second Amendment rights to get massacred by firearms. Greenwald also has a very thorough piece on Miranda, but let me just add two points: First, Miranda has been good law for some 50 years in America. If the tough guys don’t like Miranda, then they can take their own medicine – the one they prescribe to anyone who complains about American values – if you don’t like the law, move to another country. And second, in practicality, Miranda is nothing more than an evidentiary rule. When the government (ie, the police) violate your Miranda rights – meaning your right to counsel and remain silent and not self incriminate – what Miranda does is exclude from trial any evidence procured as a result of being denied counsel. Not giving Tsarnaev Miranda doesn’t mean he loses his constitutional rights to a counsel and to remain silent (which come from the Fifth Amendment). It just means that he doesn’t need to be told of those rights. I do wonder whether Liz Cheney – complaining that suspects get to “lawyer up” – hates just some of our freedoms or all of them. My bet is that she has no problem with suspects “arming up” (and probably has an exception that would allow her daddy to “lawyer up”). At the same time, another act of terrorism was being perpetrated in the homeland, but which has been given much less attention. Both the president and a member of congress who voted in favor of gun control received ricin-laced letters. Sounds like a stronger case of terrorism than the Tsarnaevs, plus one with a more clear political motive. At the time of the Boston bombings and on the days following until the Tsarnaevs were finally identified, everywhere in the blogosphere and on the social media sites, Muslims were desperately hoping that the heinous crimes were not committed by Muslims. This fact highlights, contrary to what is regularly portrayed in the media and by our tough guys pundits and politicians, that Muslims do not support violence. And as I have written on countless occasions in the past, if you were to conduct polls of Americans and Muslims worldwide, you would see that Americans are much more supportive of military and violent solutions to conflict than people in predominantly Muslim countries. Americans are unique, again, in their thirst for military retribution and in their awe of all things in fighting attire. Muslims also see that those rare few who cite Islam as their reason for violence not only give Muslims a bad name, but also directly and negatively affect them in their every day lives – not to mention the numerous violent acts against Muslims (and those perceived to look like Muslims) and Mosques across America. Why Aren’t Gun Owners Shamed? Once the Tsarnaevs were identified, the mainstream media everywhere pointed to the fact that one of the brothers had posted “Islam” as his worldview on facebook, as if the mere invocation of the name of the religion itself were incriminating. Of course, Islam does have a very big public relations problem. Furthermore, it lacks a pope or other central religious authority (or an NRA) to speak on behalf of the billion Muslims worldwide and give its condemnation of violence a singular voice. Nevertheless, there has not been a major religious authority anywhere in the Muslim world who has not condemned the attacks of 911 or elsewhere or who has actually advocated violence. Contrast that with George W. Bush would said he had a calling from God himself to invade Iraq. But more importantly, contrast the constant and persistent calls on Muslims around the world to unite and condemn these violent acts. First, I would argue that that is exactly what we were seeing this past week and at every other similar act, regardless of those voices receiving little to no media coverage. But more importantly, why should they? We do not hold gun owners to the same standard. Every time a gun owner (or someone in possession of gun) shoots into a crowd of people or kills 20 little kids, we do not ask for an explanation from all gun owners around the world. We do accuse all gun owners of sharing a portion of the responsibility. And we certainly do not say that gun ownership is inherently evil and that gun ownership is the great evil facing the world today, even though gun related deaths dwarf death by Islamic terrorism in the U.S. Furthermore, guns are specifically made for killing, and anyone who owns or possesses a gun, therefore has chosen to put a killing machine into her hands. Don’t get me wrong. I am not saying that gun owners are the equivalent of violent extremists, but merely trying to show the absurdity and hypocrisy behind categorizing an entire class of people as being dangerous based on the relatively smaller threat of a tiny few. We can fight all of the overt and covert wars we want in Afghanistan, Pakistan, Iraq, Yemen, Somalia, or elsewhere with soldiers on the ground or with drones. We could even go so far as prohibiting all passengers on commercial flights, but there really is nothing we can do to stop a crazy guy from going “postal”, be that your average American psychopath or a terrorist with a gun, a frying pan, or something else. It is just the nature of the world we live in. Nevertheless, our friends the tough guys are adamant that we defend our nation by restricting the Fifth Amendment, protecting the Second Amendment, and fighting costly wars against people who probably couldn’t find the United States on a map. As an American wouldn’t you be just a little embarrassed by the extravagant display of resources to capture a 19 year old national security threat? One of the most interesting things to witness during the search for the Tsarnaevs was the stark difference between how we go about a manhunt when the bad guy is located in one of our own towns, amongst our own citizens and when he is located in Afghanistan, Pakistan, Yemen or Somalia, among non-voters. At home, we encircle the neighborhood. We bring in police officers, dogs, helicopters, etc. We close shops, tell people not to leave their homes until we finally locate and capture the assailant. We act with excessive care. Thanks to modern technology, when we believe that there may be a potential bad guy located in a village in one of the above mentioned foreign countries, we don’t bother with the annoying mess that is the house by house search. Instead we just send a drone into the sky and bomb the area where we believe the bad guy to be located. If we miss, we miss. If someone else is killed, well, most likely he was a bad guy too, so who cares? Taken to an even more extreme example, you have Israel firing missiles into the densely populated Gaza, one of the most densely populated areas in the world. Can you imagine if we followed the Pentagon, CIA, or Israel’s modus operandi to capture Tsarnaev by firing missiles into Watertown? Because, that my friends, is how we are winning the hearts and minds in foreign places.